1. Fully comply with laws and related regulations. 3. Recycle resources to deduct quantities of wastes. 4. Concern on energy saving. 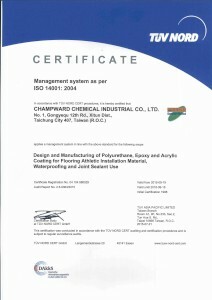 Champward Chemical implement a rigid environment management system in all aspects of operation from product design, sourcing, manufacturing, storage, shipping, and final application of products. Our dedication and efforts were accredited by ISO 14001 registration.